Looking for our FIRST CLASS review? That’s HERE. This review contains 360* Images which YOU control. Swipe with your finger (mobile) or click and drag (desktop) to see whatever angle you’d like. Up, Down, Left, Right. I absolutely adore the entrance to the Galleries South lounge in Terminal 5. A large scale model A380 and a horse, what more could you ask for? I suppose if you’re being picky, you could ask for a nice buffet, some Tattinger, top shelf liquor and comfy seating areas. Granted! As I was busy bothering lounge guests with my camera, flashing pictures of everything under the sun, I stumbled across one time teenage heart throb (not to me) and current TV star from the show The Affair, Joshua Jackson, who accidentally made his way into the 360* above. Can you spot him? As with all (I think?) British Airways lounges, Tattinger Brut is available upon request, they just won’t leave it out for you to guzzle. I asked a server who kindly brought over as much as I pleased, one glass at a time. Grey Goose, Bombay, Glenlivet, Johhnie Walker, something for everyone. If you’re interested in the wine selection click here. Ah, the front row of the upper deck, 50A and 50B. If you snag a window seat, you’ll enjoy tons of extra storage areas utilizing the negative space on the outside of the cabin. Welcome aboard, as you can tell from our happy (alcohol induced) faces, after a warm welcome from the crew, who we brought Ferrero Rocher chocolates, we were ready and quite excited to embark on this roughly 12 hour flight to San Francisco. For those traveling together, I do think that the window and aisle combination, rather than the center two seats is the best pick. Unfortunately, one of you will draw the short stick and end up on the aisle, which while lovely, is exposed to the cabin. I didn’t mind at all. I enjoyed the direct aisle access and being in the front row, the seat, though exposed, was very private. Speaking of privacy, a large contention with many people is the privacy divider, which in the photo above, is down. if traveling with a companion it’s a joy to speak to each other face to face while sitting comfortably. If you have a seat mate who is hitting on you, as was the case with the people behind us, just press one button and send the divider up. It’ll look like what you see below. No hard feelings?…. Twelve hour flight, it’s about the bed. With the curtains drawn, we were secluded in the front of the cabin in 50A + 50B. With the privacy screen up Laura could have been Kate Middleton and other than the twelve security guards surrounding her, no one would’ve noticed. I love the length of the bed and the open foot area, allowing you to fidget. I constantly fidget. I’m all about passenger experience, and though the A380 boasts some nice passenger features, there are none more noticeable than the f**king gigantic bathroom. This picture doesn’t paint the picture, but just wait until you see the 360* VR image below! You could cook dinner in there! I felt almost giddy after the flight because we had such a wonderful, seasoned professional crew. We were extremely well looked after, always with a smile, and always glad to top off the stunning Carmel Road Pinot Noir, which is hands down the best wine I’ve had on a plane. Full menu’s can be read here: beverages, main meal and light snack. I was slightly reluctant to try the curried scallops ahead of a long flight with only a few lavatories, but the temptation was worth it. Very tasty with nice cauliflower. Inventive stuff. I think we’ve been through this, but your senses are dulled at 30,000 feet. Only bolder flavors and fragrances prevail. Luckily, this steak in a demi glace with truffle risotto packed tons of aroma and taste. As far as steaks on a plane go, it was a great one! And yes, more Tattinger. Not pictured, but included in a couple 360* VR images was a decadent dessert of chocolate tarte with hazelnut and pretzel with a caramel mousse. It was divine, and in Laura’s opinion, the best dessert we’ve ever had on a plane. Remember that time Zane left One Direction and lots of girls fainted? Neither do I, but that’s just about how I felt when the crew kindly arranged a visit to the flight deck for me. It’s gigantic! The pilots couldn’t have been nicer or more professional and it was a thrill to see the nucleus of the amazing aircraft. 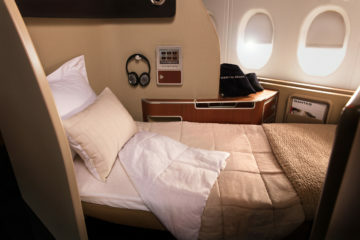 As to the experience, flying business class, especially when paying borderline economy prices, as we did, is always a huge thrill to me. It’s an incredible upgrade to travel from start to finish. Our crew were all extremely senior, truly honing their craft over the years of flying and they looked after us with precision and personality. I felt important, I felt appreciated. Previous ArticleHUGE NEWS: American Airlines PLATINUM Status Challenge IS BACK!